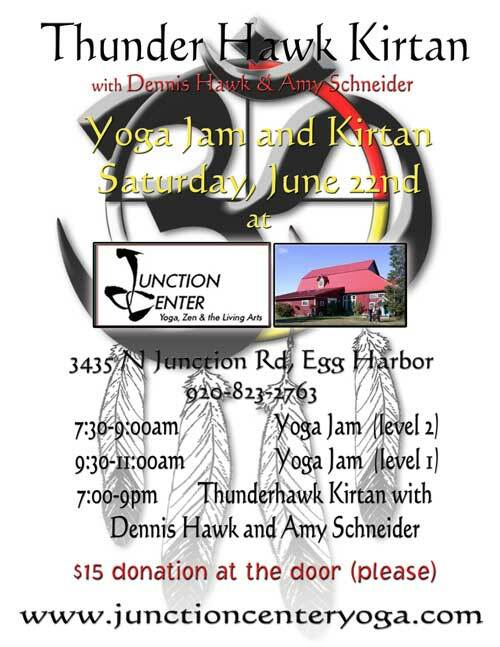 Join us at Junction Center Yoga Studio on Saturday, June 22 from 7 – 9 pm, as Dennis Hawk and Amy Schneider lead a shared musical experience known as Kirtan, featuring Sanskrit mantras set to fresh melodies and sounds. Kirtan is intended as a holistic healing experience designed to bring participants into a more organic form of meditation, either in stillness or in motion. One of the oldest of sacred sound traditions, Kirtan’s call-and-response chanting involves Satsang, an ancient Sanskrit term that describes the community that exists between an assembly of people who listen to, talk about, and assimilate their impressions of truthfulness. On Solstice Saturday morning, Level I and Level II yoga classes at Junction Center will include Yoga Jams – live music to accompany your asanas.